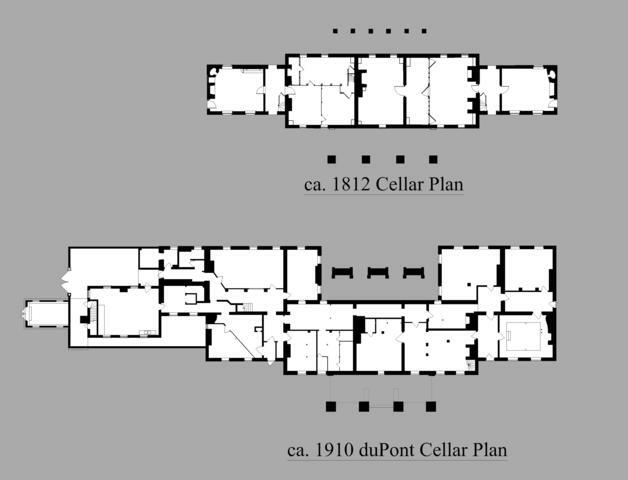 Similar to the rest of Montpelier, the duPonts made major renovations to the house’s cellar spaces in ca. 1901 and ca. 1910. The 1910 changes involved the addition of a large kitchen to the north end of Montpelier. Amazingly, prior to ca. 1910, the duPonts had been using the same kitchen space President Madison's household had used almost a hundred years earlier. Other changes included removing and replacing all of the existing wooden partitions and taking up the existing flooring. In place of the Madison-era floors, the duPonts poured new concrete floors throughout the cellar. The duPonts made changes to the cellar floor plan in ca. 1901 and in ca. 1910.